The general tendency of the whole Canary tribe is to struggle out of darkness into light. 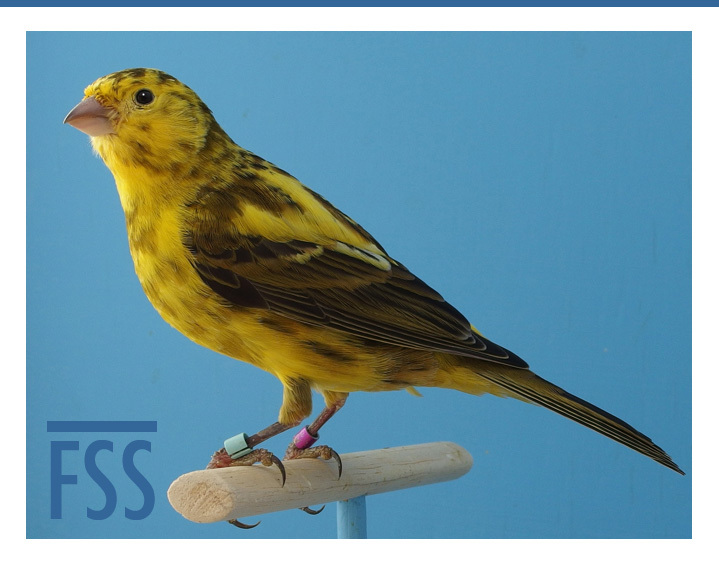 In this short series we have looked at variegation through its manifestations in other species: greenfinches, budgerigars and chickens. When it comes to visual impact however, no canary accomplished the ‘struggle out of darkness into light’ with such panache as the London Fancy. The disappearance of the breed during the last century added mystique to its allure. No wonder that canary fanciers have been so keen to regain what they had lost. That allure was based on its transformation from a drab green juvenile into a golden adult with dark wings and tail. This effect was achieved by the disappearance of melanins from the new feathers, leaving the yellow ground colour exposed to view. It was this vanishing act that prompted me to suggest that it was controlled by a fugitive black gene (2). Piet’s birds are well known, but we tend to see only the finished article. We don’t see the process, a champion emerging from dark obscurity into the bright light. It was not until last year that I had the opportunity to watch this spectacle unfold in my own bird house. By the end of the moult, the bird was transformed. Most of the dark melanins had melted away; the ground colour shone through and contrasted vividly with the dark wings and tail. His underflue is mostly dark, which undoubtedly adds depth to the yellow. His legs and beak are reasonably dark, but not as dark as you would see in a Lizard. Note, however, that it took him two years to display these qualities. It was a classic case of an ‘ugly duckling’ turning into a ‘beautiful swan’. Even though the bird was only about 60-70% clear, the contrast between the yellow and black was striking. It was the first time I had witnessed the fugitive black gene in action and I found it spell-binding. He was the first bird I would check when I entered the bird house in the morning; eager to see if yet more dark feathers had vanished into the night. I make no claim that he is a London Fancy, or even that he possesses the ‘London Fancy factor’, but he has undoubtedly inherited the fugitive black gene. The Illustrated Book of Canaries and Cage Birds by Blackston, Swaysland and Wiener (1878-81) p.175. I am wondering that the so called ‘fugitive black gene’ is in part what happens in human hair colouring – ie it is a genetic issue and has a relationship with age. With age we (or some of us) lose the colour in our hair and we go grey or silver. This is as a result of the pigment cells in our hair follicles gradually dying. When there are fewer pigment cells in a hair follicle, that strand of hair will no longer contain as much melanin and will become a more transparent colour. Could this be when the underlying ground colour comes through during successive moults. In the LF birds certain of the melanin producing structures might have a very short life span – a function of the genetics of the bird – a complex issue as the flights and tail retain the ability to produce melanin as the dark feathers show. So perhaps more ‘aged’ or ‘deceased’ black gene rather than one that is running away or hiding…??? If that was the case, how do you explain the dark underflue? Similar to my hair – plenty of grey (some might say mainly grey) on my head but on my arms and legs the hair is still dark brown. Ie. the genetic/age influences seem to be zonal. Not so. The dark underflue grew on the same feather, after the clear vane. That couldn’t happen if the melanin progenitors were ‘deceased’. Surely that means that the black gene isn’t ‘fugitive if it is still manifesting itself. Is there therefore some mechanism that is switching the melanin progenitors on and off? i rushed outside to check one of my own birds witch moulded in a specific way the last years. All this makes me think of a newly accepted mutation in the colour canary world which the flemish and dutch call “kobalt”. See http://www.nbvv.nl/download/standaardeisen/Kleurkanaries_2016.pdf page 50 onward.